This summer “under the Tuscan sun” has barely started and it is already very “hot” both as far as weather forecasts goes but also for the the numerous, quality events scheduled around the region every weekend. Wherever you are this upcoming weekend, you’re surely find some interesting events and things to do, both in the bigger cities as well as the smaller villages. This Friday, June 29th the little village of Anghiari, near Arezzo will live a special feast day. The local community celebrate the anniversary of the important Battle of Anghiari (maybe you’ve heard of the famous Leonardo da Vinci fresco in Palazzo Vecchio in Florence?) which took place in 1440. From early in the morning, the narrow streets of Anghiari’s center will host “the trades of the past”, with archers and crossbowmen at disposal to anyone who wants to learn archery, crossbow or the art of swords. At 6pm the ceremony of the Palio della Vittoria gets off to a start, consisting in a hard uphill run that will start around 8pm from the Cappella della Vittoria (Victory Chapel). If you are curious to know something more about the Battle of Anghiari, read here. June 30th is the day this June for the traditional Gioco del Ponte (Battle of the Bridge) in Pisa. At 7pm a historical parade with over 700 people in traditional costume will march along the four Lungarni (the long avenue to the sides of the Arno river). Afterwards, on the Ponte di Mezzo the real “battle” of the Gioco del Ponte takes place. Here, the two city teams Tramontana and Mezzogiorno will face each other is a sort of “tug of war” but opposite: trying to push a heavy cart located on a track on the bridge toward the opponent. If you’re interested and want to learn more, you can read more info here. Also in Pisa in the coming days will be held a few concerts in the cloister of the Cathedral Museum, in the event called “Musica sotto la Torre” (Music under the Tower). On Thursday, June 28th a concert of classical music with works by Mozart will be performed by Chamber Orchestra “Luigi Boccherini”. On Monday, July 2nd you can assist to a jazz interpretation of some Bach’s pieces. Classical music on Thursday, July 5 with Mozart performed by the Ensemble L’Etoile. Performances begin at 9pm, tickets price 12 €. For more information, visit the OPA Pisa official site here. On this Saturday, June 30th San Gimignano will live a special night full of events. It will be a “white night”, an Italian way of saying a long night since all the events are at night and you try to stay awake until the early hours of the morning! The “Nottilucente” will start at 5pm on Saturday and will continue until 5 am the next morning. During these twelve hours in the famous medieval village, all kinds of events will take place for all ages: street shows, exhibitions, concerts, dance performances, poetry, DJ sets. The schedule also includese games, readings and events for children. This should be a really excellent opportunity to better appreciate the “city of the beautiful towers”, one of the many small jewels of Tuscany, which is often wrongly considered a quick stop and go destination. 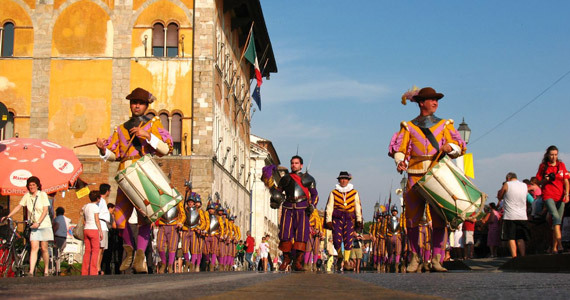 The Lucca Summer Festival is one of the major musical events of summer in Tuscany. Its starts on June 29th with a concert by Tom Petty and The Heartbreakers in Piazza Napoleone. On Wednesday, July 4th will be the turn of Blink 182. For complete program and ticket information, visit the official website here. It will be a medieval-flavored Sunday this July 1st at the Santa Barbara Fortress in Pistoia. From 10am to 8pm the “Fortezza dell’Orso” (Fortress of the Bear) will take place, a special exhibition that opens a month full of great events in Pistoia, including the Giostra dell’Orso on Pistoia’s patron saint day (San Jacopo, 25th of July). During the Fortezza dell’Orso you’ll see exciting challenges between archers dressed in traditional costume, a medieval market, flag wavers, musicians and falconry exhibitions. Admission is free. We also remind you that in Cerreto Guidi this Saturday, June 30th you can celebrate “The Night of Isabella”, read all details in this dedicated post.